Amillia Taylor, the world’s youngest surviving preemie, appears in this weeks issue of People Magazine. 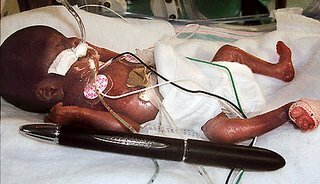 The micro preemie was born at 21 weeks 6 days gestation, weighing less than 10 ozs and measuring just 9 1/2 inches long. Her chances of survival were probably 0% at birth due to the fact that the extreme limit of viability is 24 weeks and not many statistics are available for a baby at that gestation. 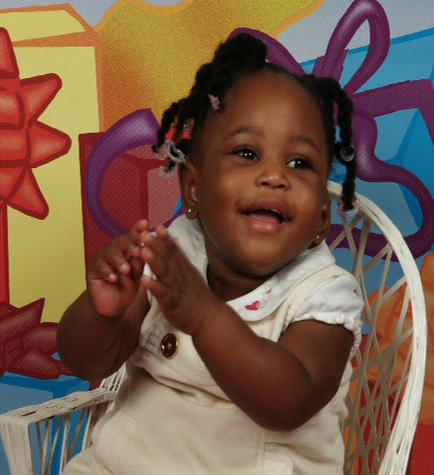 She defied all odds and joined her parents at home of February 22 of this year. Her weight on the day she left the hospital was 4 1/2 lbs. People magazine caught up with her family last month and had some great new to report on Amillia’s progress. The little pudger is now tipping the scales at 14lbs 3 ozs. She is able to hold her head up and sits with support. Oxygen is still required at night while she sleeps, which is common for preemies who have spent extended times in the hospital. Her care, with insurance coverage, has put her family $40,000 in debt. please tell me what can I do? On Jan. 14, 2008, I also gavebirth to a preemie was was just under 22wks and the pediatrician refused our wishes to do whatever they could to keep her alive. My daughter was alive for almost two hours. We were at a hospital with a level 3 nursery yet no x rays were taken, no surficant (i know I mispelled that) therapy was offered. It isn’t right. My daughter was 13inches, 525 grams, and she laid in my arms gasping for air, no ventillators. On Jan. 11th., I went to the emergency room because i had some disharge and bleeding. Test were ran and I had an ultrasound, it showed my baby was viable. The hospital neglected to inform me that it wasn’t just discharge but my mucous plug came out. On Jan. 13th., I had some lite pain in my stomach. It felt like gas, I didn’t think it was labor because my doctor went over the signs and said that labor will feel like something I never felt before. I woke up after midnight with heavy bleeding and pain. Again I went to the emergency room and told them that I was in pain with a gas-like feeling. I was given an enema and an ultrasound. The ultrasound showed I had leakage. At the time I was discharged, aound 6a.m., I was told that I needed to go to see my ob/gyn asap but never was I informed that I was in active labor. The only thing that was told to me just as I was leaving the hospital, was that there are no ob/gyn’s on staff in the ER at that hospital. Something that could’ve been told to me when I went in on that Friday. If I would have been given that information there is no way that I would’ve went back to that emergency room. I called my ob/gyn ofc as soon as it opened and was told to come in. That’s when I found out that I was in active labor. Across the street from the ob/gyn is the hospital where I was to give birth but the dr. said to go to another hospital where the specialist was. So in active labor, unable to even walk, my daughter’s father drove in traffic about 13 miles to the next ER. By the time I got to the hospital, I had dilated 5cm. I was told then that my only option was to either hold my legs in the air and see if she would go back up or to push her out. We asked if we could go to another hospital but was told that the ambulance ride would be too risky in case of complications. I arrived there about 10:30am and I agve birth to her around 2:40pm. She came out, never opened her eyes but even the doctor said she was bigger than they thought she would be yet still refused to run any test. We were told it was the pediatricians discretion whether or not to perform work on my child and the pediatrician refused. So she lay there, grasping my finger (she was strong enough to do that) just waiting to die. When they told me that she would pass shortly after she was born, I didn’t think she would stay alive after 10mins or half an hour, but to see my baby struggling to breathe on her own for almmost two hours when there was equipment there to help her, it just seems inhumane. If there was no ob/gyn in the ER when I went on Jan. 11th, I feel it was the ER’s responsibility to immediately refer me to another ER that had an ob/gyn. I understand why I didn’t know it was my mucuos plug that came out, but it doesn’t seem right that professional emergency staff, ob/gyn or not, didn’t know that. And why was I given an enema during active labor when bowel movements cause you to push? Nowhere on my discharge paperwork does it say I was in labor, it just says to see my ob/gyn asap and take tylenol for pain. And what about my medical center sending me to drive myself during rush hour to the other hospital? I was the patient yet I feel like nobody who I went to for help to keep my child alive helped. The birth of this miracle proves that there could have been a chance for my daughter to live, there was no way for staff to tell beyond a reasonable doubt that she couldn’t make it. I am not naive, I understand that even with help she could’ve passed away, the point is no one even tried. I strongly feel that the reason the hospital didn’t try was because of the financial part of it, I was on medical. Was my daughter’s life sacraficed because of politics? If I had insurance would the story be different? If I could’ve afford to pay out of pocket maybe they wouldn’t have been so reluctant to help me save my daughter, Lyric KayeAnn Wilson. Can anyone help me? I don’t know much about hospital policy Antoine’tte, but I think that’s what it comes down to….hospital policy. She probably had to weigh so much and be a certain gestation (usually 24 weeks). I’m sorry to hear about your daughter. What you went through is absolutely HORRIFIC. I am SOOOO sorry the “professionals” were such asses! This is just like what they do with “aborted” babies that survive. They let them die. How sick. Know your little one is in Heaven- full of peace with Jesus. Hope you’re getting some sort of counseling to help with your grief. The same thing happen to me….I went to a level 3 and my baby also passed. They denied o2 on her. It hurts so bad. I was 23 weeks due to preeclampsia. Antoine’tte I don’t know if you’re still checking this string, but I hope you have thought about speaking to an attorney. Your daughter was born alive – letting her die with no intervention or at least oxygen to keep her comfortable is at least medical malpractice, (negligenc) and depending on your state, possibly a criminal shortening of her life. 100% ridiculous behavior on the part of the hospital. Talk to a medical malpractice attorney. Usually they work on contingency – they only get paid if you do. A and L, They’re called “baby doe” regulations – prohibiting hospitals from witholding care from preemies. if your state has such a regulation, and even if they don’t – please sue the scrubs off those awful hospitals.